Overnight the Asian markets lost 0.4%. Europe opened lower but gained 0.4%. US index futures bounced around overnight, and the market opened flat at SPX 1679. After an early dip to SPX 1677 the market rallied to 1688 by 10:30. Then after another pullback to SPX 1682 by 11:00, the market rallied to 1692 by 3:00. A dip into the close ended the week at SPX 1691. For the day the SPX/DOW were +0.60%, and the NDX/NAZ were +0.90%. Bonds lost 13 ticks, Crude added 30 cents, Gold slid $7, and the USD was higher. Medium term support moves back up to the 1680 and 1628 pivots, with resistance at the 1699 and 1779 pivots. Last night the FED reported a decline in the Monetary base: $3.528tn v $3.546tn. Today the WLEI was reported lower: 54.8% v 54.9%, and long term Investor sentiment rose: 54.5% v 52.3%. No monthly Payrolls report, or FED speech reports, due to the shutdown. The market opened flat today but then resumed yesterday’s rally. When the SPX crossed 1685 we posted a tentative green Int. wave A label at yesterday’s 1670 low. Intermediate wave B appears to be currently underway. A 38.2% retracement would give us an upside target of SPX 1693; a 50% retracement SPX 1700. When Int. B concludes we expect the market to head lower in Int. wave C.
Short term support is at the 1680 pivot and SPX 1654-1665, with resistance at the 1699 pivot and SPX 1730. Short term momentum hit overbought today after being quite oversold yesterday. The short term OEW charts flipped positive again with the reversal level now SPX 1687. Best to your weekend! One can make a very valid argument that the bellweather index now is not the DOW, its the NASDAQ. Its where most of the technology and leading growth names are in this newer world of Biotech and Tech. Elliott did his work in a bygone era when of course 30 dow companies were the bellweather. I wonder if anyone on this board even trades or owns any DOW stocks, I know I dont. What year is it? 2000? I’m headed out to load up on some Nortel stock. Curious how nature seems to selects psycic unstable individuals (firstly) to convey messages pointing to a malfunctioning system or an impending directional change. First out was the poor schizoprenia affected woman and then secondly the man that just recently put himself on fire. As usual the crowd then sooner or later “Wakes up” and a mass movement follows. In Norway as I have been speaking of before, the mass killings at Utøya made a popularity peak for the affected Labour party. Latter to the incident the right wingishly oriented (contrary to all common and sane thinking) got increasingly more popular and won the election together With the less blueish conservatives. As I have also conveyed in earlier posts, the individual himself isnt freewillishly responsible but merely a tool for the Whole population(or nature) in signaling directional changes. Freakishly strange it is, but we experience similar phenomenons in the stockmarket. Buying at a bottom or shorting at the top, no sane person can ever master. Maybe, just maybe do all Americans know deep in their heart that grave inequality in the Access to Healthcare just isnt right….and that Obama just migt be the courageous hero will eventually give relief to the whole nation from its bad hidden consience. Maybe the line between fairnes humanity and socialism isnt as Clear cut as republicans wants it to be ? Just a thought around the sin of inheritance, or ? Nice post and keep update in future also.Thanks for sharing such information with us. torehund, I’m not really understanding what you’re saying is happening in Norway, but it sounds like a violent change; then again, most change is violent. Regarding The Affordable Care Act via Obama, I would argue that this edict was ushered into being unlawfully. Pres. Obama did not have it properly ratified by Lawmakers, according to laws of USA. That said, I personally don’t believe the 16th Amendment (Income Tax) was properly ratified, as compensation for labor should not be considered ‘income’ in the historic sense of the word. Same with Social Security. Given these beliefs on my part, some would say I belong to “Live Free or Die”, but I’m not that radical. Please put in easier to understand terms (probably language difference) what is happening in Norway. It’s a country I take great interest in. Norway discovered great oil reserves back in the early 1970, and the aim was at that time to secure that the funds were used to provide infrastructure and New Growth for a time when the oil would no longer be available. Yes we did retrieve the oil but did nothing constructive With the funds (placed them in Stocks and bonds around the world). In th meeantime we have endured massive inflationary pressure that made us non-competitive in most areas but retrieving oil and harvesting salmon from Our fjords. The left over workforce was then fueled into an ever increasing bureaucracy that is quenching the last efforts of entrepeneurship. In addition to this we have endured migration from Africa and Pakistan to such an extent that 1/3 of the Capitol now consist of not very well Integrated immigrants. The oil reserves are rapidly declining and we have the largest sosial Budget in the world. Most productive Companies has flaged out due to high COSTs and are now in Asia, Arabia and lastly the state owned oil Company Statoil is building New Offices in Aberdeen Scotland. We are currenly living on the yields of the oil fund extracting 4 percent of the surplus year after year. If stockmarket descends 10 percent do we have to consume minus 10 percent annually ?, lol. Norway is nearing the top of an epic bubble and is running like a large Casino. I expect the running on fumes to last a bit longer as the conservative party is set to revive the economy by injecting 5 or 6 percent into the economy annually. As you see, this is a recepie for ultimate economical disaster. Its natures way, we in Norway are on the 5th wave but a double 5 i think, With one 5 left to go. And nothing can be done thats the sorry part. torehund, to steal a phrase from Al Pacino in “Scent of a Woman”, it’s not that nothing can be done, it’s just that what has to/needs to be done is TOO DAMNED HARD. The pain and sacrifice it would take to correct and get on the right path is more than politicians and the average person (not to mention the very rich) is willing to do/deal with. We have much the same situation here in The U.S. Invariably, you find this in all cultures in the 5th wave process. Agree fully M- its only very late in a turn, and after some catastropic event that a change is feasible, or you will be ridiculed or in some places decapitated utttering the “yet to become truth”. We can only ride the crazy Waves, initial revolt is sorrly the duty of the mentally unstable. However, we can vote With Our feet and move to another country as long as Our currency is ok, without that latter option we will go Down With the ship we are sitting in. Thats why Money in the bank is Dangerous too. torehund, I hear you. My Greek friends say that all the young people who are able to leave the country are splitsville, in droves! For the most part, the elderly and ill remain. No country can stand up to this emigration for long. Eventually it will collapse. M-thats what the Germans want cheap Young labor from Greece keeping a lid on labor costs. But even if Greece suffers, the currency dont suffer equally(euro) so if you are in cash you can flee, if you have property you are still stuck. But the USD and more seriously still the NOK are single currencies and a drop will make all what one have plunge once you set Your foot abroad. Thats why we have to have Our eyes wide open. I have a dollar and a nok account so that I can adjust. to you too M- and please buy some peix, and blaim it on me only if it aint a winner.. Thanks for the update Tony! That b wave sure did take hold! Great call! I was expecting more down given the somewhat unconventional c=0.5x a extension, but this market has it’s share of weak c waves… (e.g. int. med. c of major 4). oh well, great bull trap! have fun with the boys! Nothing to fear but fear itself. Isnt thats what he is saying ? Hmmm, interesting. I used to follow baseball closely, especially in the 2000’s when the Sox were exciting. But have lost interest over the past few years, more of a football fan than baseball. That said, the Sox are looming good! 1-0 after today’s win against the Rays! Scary & interesting, don’t you think? McM, the Plum Island bio-warfare research lab across Long Island Sound from Lyme, Connecticut may not have been opened yet in 1941. After WW2 the government brought over a German scientist who specialized in the weaponization of diseases of ticks and mosquitos to head it. The disease itself is native to Eastern Europe although that is never mentioned. Just one of many reasons that we will eventually take out the 1932 lows in real dollar terms – because they want it that way. zvy, I know all about Plum Island and assure you that Borrelia infections were in the USA as soon as the Anglo population began to move into this country, in fact, even before that time. Tick Bite Fevers are recorded as far back as The Egyptians. I had advanced Lyme, more specifically known as Borreliosis, and got infected via congenital transmission. The particular strain I had originated in Central Europe, and has not been found in nature here in almost 30 years (I’m 57 yrs. old). Regarding ALS, most advanced cases of Borreliosis in men manifest as ALS, while advanced cases in women manifest as MS.
zvy: Here’s what’s happening w/TBD’s presently. Scroll down and watch the film. You might save a life because of it someday. The market opened flat, tested yesterday’s neckline for the first half-hour. Finding some footing, the SPU’s ran ten handles up in sixty minutes. A Boehner news conference took five handles out of the market. While he was full of vitriol, price hardly moved. With bad news not pushing it down, traders stepped in and walked the SPU’s up another ten handles until the MOC sell-side imbalance came out at 90% sell at 700 mil. Those orders were mostly matched (200 mil on the close), and we closed near highs of the day. A simpler way to express the moves since 1670 is this: ten up and five down, rinse and repeat. We’ve done it three times in twelve hours. My interpretation of the three’s count from last night was a bust as the final 3 in a 333 truncated. However, the count shows the value of looking at the ‘3’s. The final b-c amplitude and frequency was the lowest of the recent declines: it marked a reversal. Friday’s closing price on the c-x connector matches the amplitude high of its brethren. There’s a lot of price congestion between 1688 and 1705, the Larry Summers and the FOMC gaps. Tony notes the 38.2 and 50% retracements in his summary. If we get another 5 down and 10 up, it’ll put us exactly at the 50% retrace. That’s odd, it worked for me on two separate machines and three different browsers where I have no cache data enabled. “As our cycle times seem to be shrinking, let’s look for three days or less. ..” This is very important to keep in mind, and I think will surprise many (not necessarily many on this site.). Have you got a current Pitchfork chart for the SPX? what is a pitchfork chart ? I made a chart in which we are in the first part of a reversed five upwards, still sticking to it. For the smallcap futures I think there is a lot to gain yet as for the nasdaq. SP 500 well the bull is aging but when the two former performs why ogo for the lesser one. I play the undervalued Stocks that have mostly descended from year 2000, as the bull matures out I hope they will retrace part of their declines. Currently 1 usd is 6 nok, but I am starting to play With a bottom of usd at 1 usd to 3,8 nok. 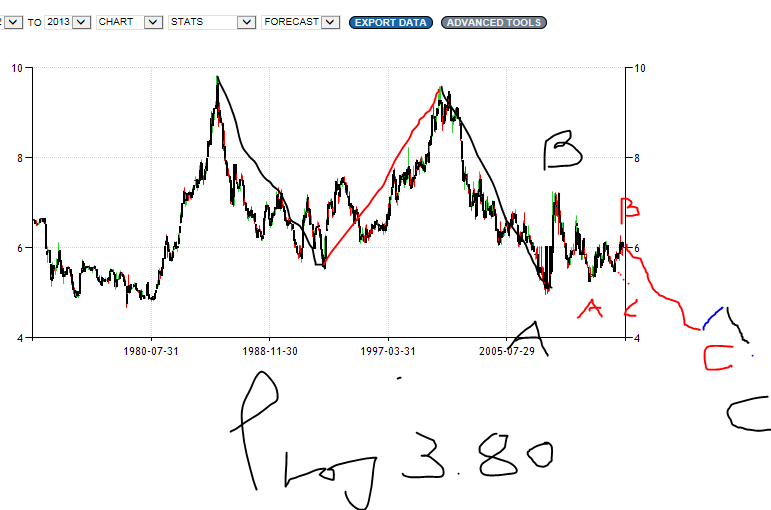 Its pretty far Down and it would require a strong commodity rally and a Cold winter. However, looking at the strength of crude right now and the ever more hot printing Activity in the US, it just might happen. Oil projection is then around 200 usd. One good thing about a possible usd decline is that the middle east would then be able to still purchase vital commodities(in spite of lesser oil Resources) and europe would get a breather too. And for uncle Sam this downturn would “Lock in” already US Citizens to remain in their country working, until it some time in the future has rid itself of a swelling bureaucracy replacing productivity . The latter made Europe deteriorate, and in Norway bureaucracy is all we have left, besides oil thats getting more and more difficult to find. Regarding the possible vast decline in the dollar, it could also possibly redistribute wealth in a major way, maybe the possible winners are the ones that believes in Obama and believe in change for the better. Maybe the New Rich ones are less reluctant to spend some of their wealth and then recharges the economy. In economy as in life, play it safe and you eventually loos it all. Namaste Tony. Thanks for the GREK. Do you expect uptrend to continue?